Don Angier sensei is the Soke, inheritor by direct succession of a classical ryuha, of Yanagi ryu Aiki Bugei of the Yoshida han. Angier sensei was bequeathed Yanagi ryu by Yoshida Kenji sensei the son of the famous Yoshida Kotaro. The fact that an ancient samurai ryuha has been inherited by a hakujin is unique. 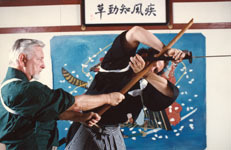 Angier sensei is one of the foremost teachers and practitioners of ancient samurai arts in the world. Preserving the legacy of the Samurai traditions of the Yoshida han has been his life's work. He has been called by such notables as Stanley Pranin, editor and Publisher of Aikido Journal/Aiki News, "a martial arts genius". While I have had many excellent teachers and coaches over the last 40 years, I would like to give credit to Don Angier sensei for giving me the insights and knowledge that have shaped my art. His has been the greatest single influence on my martial studies. Angier sensei's life long dedication to learning and teaching an obscure and ancient martial tradition has preserved precious knowledge that without his dedication and diligence would have been lost forever. I would not be able to do what I do without his instruction, knowledge and guidance over the years. None of us stand alone and the preserving and passing on of knowledge is a sacred trust that in Angier sensei's case has been well kept. Thank you sensei.